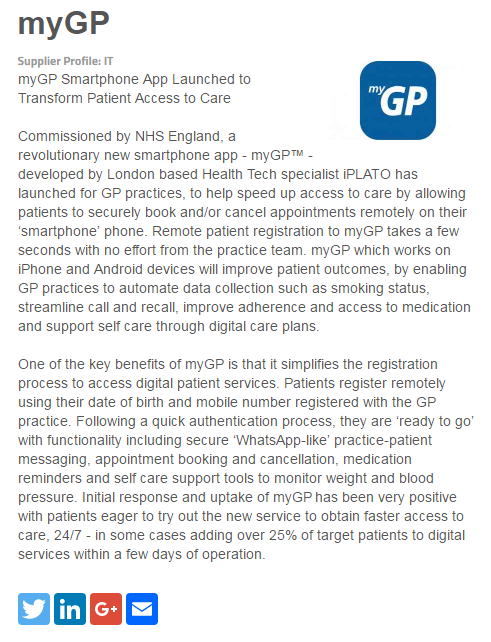 TPR has been helping to launch a revolutionary new smartphone app – myGP™ – developed by London-based Health Tech specialist iPLATO. 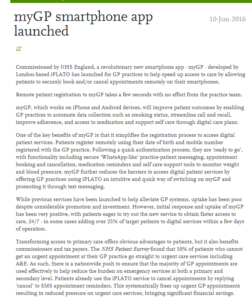 Commissioned by NHS England, myGP has been launched for GP practices, to help speed up access to care by allowing patients to securely book and/or cancel appointments remotely on their ‘smartphone’. Remote patient registration takes a few seconds with no effort from the practice team. 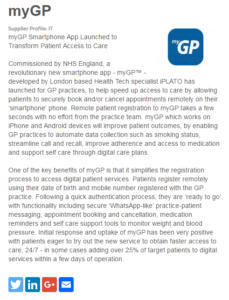 myGP, which works on iPhone and Android devices will improve patient outcomes, by enabling GP practices to automate data collection such as smoking status, streamline call and recall, improve adherence and access to medication and support self-care through digital care plans. Whilst previous services have been launched to help alleviate GP systems, uptake has been poor despite considerable promotion and investment. However, initial response and uptake of myGP has been very positive with patients eager to try out the new service to obtain faster access to ’24/7′ care, – in some cases adding over 25% of target patients to digital services within a few days of operation. Transforming access to primary care offers obvious advantages to patients, but it also benefits commissioners and tax payers. The NHS Patient Survey1 found that 10% of patients who cannot get an urgent appointment at their GP practice go straight to urgent care services including A&E. As such, there is a nationwide push to ensure that the majority of GP appointments are used effectively to help reduce the burden on emergency services at both a primary and secondary level. 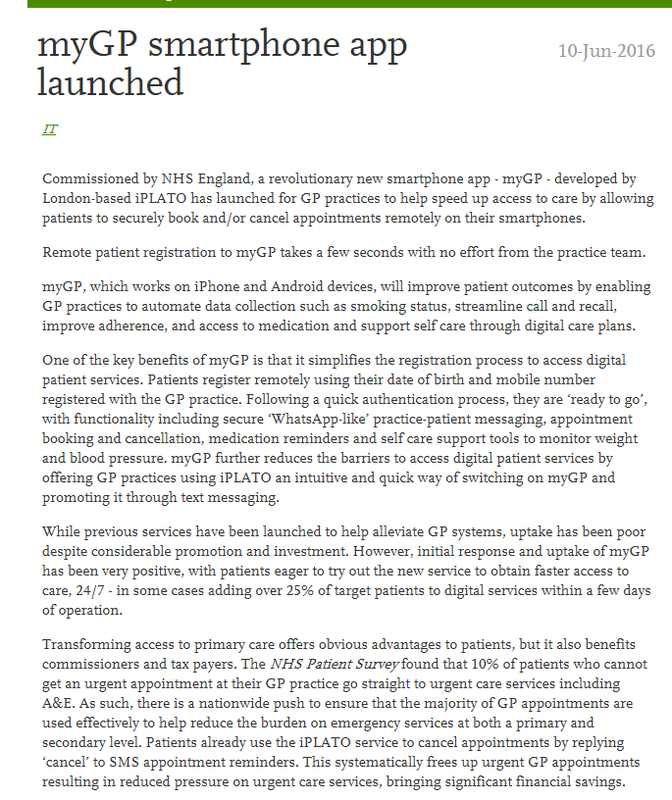 The launch of myGP comes in the wake of the newly branded NHS Digital announcement, which has been tasked to help the NHS increase its capacity to deliver modern services by harnessing digital technologies for a ‘21st century NHS’. Furthermore, waiting times for a GP appointment are also increasing year on year, with some patients having to wait up to a month to see their family doctor – yet the amount of appointments marked as ‘did not attend’ (DNAs) are also increasing. GP leaders said the ‘plague’ of DNAs was driving up waiting times and putting patients at risk. Research suggests more than 14m appointments are missed annually, at a cost of around £300m to the NHS2.